I wept each time I saw hector on FB and I still weep for him now, I only have to see his beautiful face. Sadly missed by all of us who looked for news of him each day. I have loved all my dogs even the ones who came into my rescue and were rehomed and like all mine I hope to meet hector on rainbow bridge. A beautiful tribute to Hector and equally beautiful paintings. I have four cremation boxes that hold the ashes of my beloved rescues and six living rescue dogs. I dread the day that I add one more box. Rescue dogs all seem to be amazing. It is though they know you saved them and gave them a life that they didn’t have before. 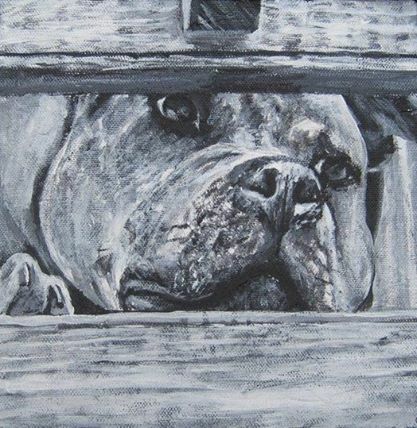 I happened upon Hector’s page when someone sent me his picture when he was first diagnosed with cancer., I looked at his page every day and marveled at how a dog who had been so hurt could be so sweet and wonderful. I am so glad he got the chance to be the dog he always wanted to be. Thanks for loving him. Thank you for sharing your grief, your memories and your incredible creative talent. Reading this post was cathartic in a way that only the grief of another dog lover’s loss can be. 6 mths ago we lost our precious Kohle, a 12lb Cairn Poodle cross who didn’t know she was a dog. She came to us, my 2 young daughters and I, and she was just one of the girls. Hector was blessed to be loved so well!!! You are much braver than most. To read your words, it is heartbreakingly beautiful. Hector is loved by so many people and he will live on forever, and you are loved and I am so happy that Hector had a beautiful life after what he saw and what was done to him. Between your writing and your paintings you truly honored Hector…. You are a blessing for adopting him!! We all think we rescue them….. when in fact they truly rescue us!! You have been love-led Clara. Love comes back to us ten-fold. You rescued Hector with no thought of any gain for yourself except the indescribable joy of loving this beautiful soul. But how much has Hector taught you about life and yourself; how much has he guided you to realise your talents and full potential?!! Because you had such a big, loving heart Clara, Hector came in and showed you the way. Dogs are wise and wonderful. God bless Clara. thank you for sharing, what a wonderful dog he was and you both so wonderful for adopting him. I love my pitties, and look forward to many more in the future. Your stories reaffirm what great dogs they are…. I came late to the Hector party. I’ve heard wonderful stories. Your paintings are beautiful. Thank you for giving him such a wonderful life. He won’t be forgotten. I hope you and Roo are at peace knowing you gave him a wonderful life. Such a special baby and very lucky to have had a parent such as u. If only all petparents were such doting parents. My soul feels your pain….my tears fall with empathy in your great loss. I awake and purposely enjoy my time however short or long with my Zero. 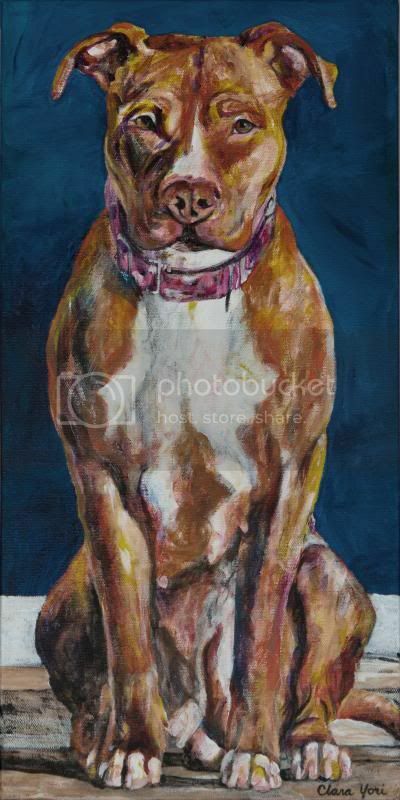 I have always, since I was a child, loved dogs…but after owning a pitbull/boxer mix at the age of 8, I knew then what a beautiful breed and so loving and loyal her soul was. I still have her ashes and pictures….and think of her often. Now, with my Zero I have poured my heart into his soul. He has poured, pawed, woofed, licked, smiled and cuddled his soul into my heart. How great God or whatever Great entity there is that brought Hector into your lives…You were lovingly chosen by whatever forces that be for Hector to love, live, and demonstrate all that his beautiful soul encompassed. What an honor….it must be…to have loved and cared for his Great Soul. All ‘our’ blessings and loving prayers in your time of greiving…. Zero and I are here for you. woof. I am so glad that you found each other. I know that Hector was an amazing and wonderful dog and I know that he was loved. 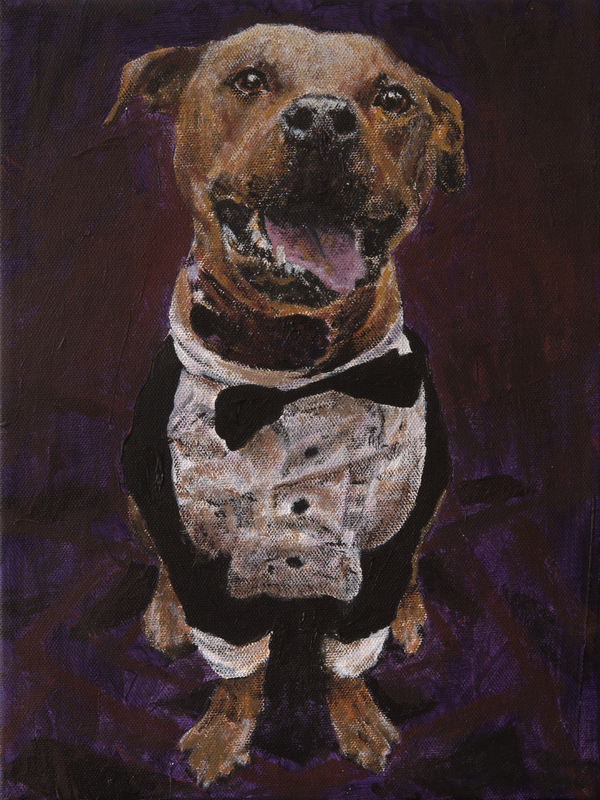 Your paintings are a beautiful representation of a beautiful breed. God bless you and I know that Hector will always live on in all of our hearts. My heart is sad…and I cry with you. Hector is a beautiful soul…so full of love. Thank you so much for sharing Hector with us…and Rainbow Bridge has welcomed him home. Your paintings are absolutely precious…just like your baby. Be blessed…and know that you’re loved. And, as Hector and Wallace made the world better, they did it with your loving care and guidance, and you make the world better! Bless you. Thanks for sharing Hector!! I know it’s very difficult letting him go but it’s good to know he’s not suffering anymore!!! Thanks for opening your home and hearts to such a special friend!!! Thank you so much for sharing Hector with us through the FB posts and photos and the wonderful narrative updates that brought him to life beyond the screen, in deeply touching ways I can’t quite articulate or understand, and for this beautiful tribute and your paintings. He touched so many lives, showing through his exquisite ordinariness the beauty and awe of life and love. May your many wonderful memories, large and small, be a source of solace and joy! Hector may be gone but he is not forgotten…He was a hero and deserved the 2014 Hero Dog Award…. 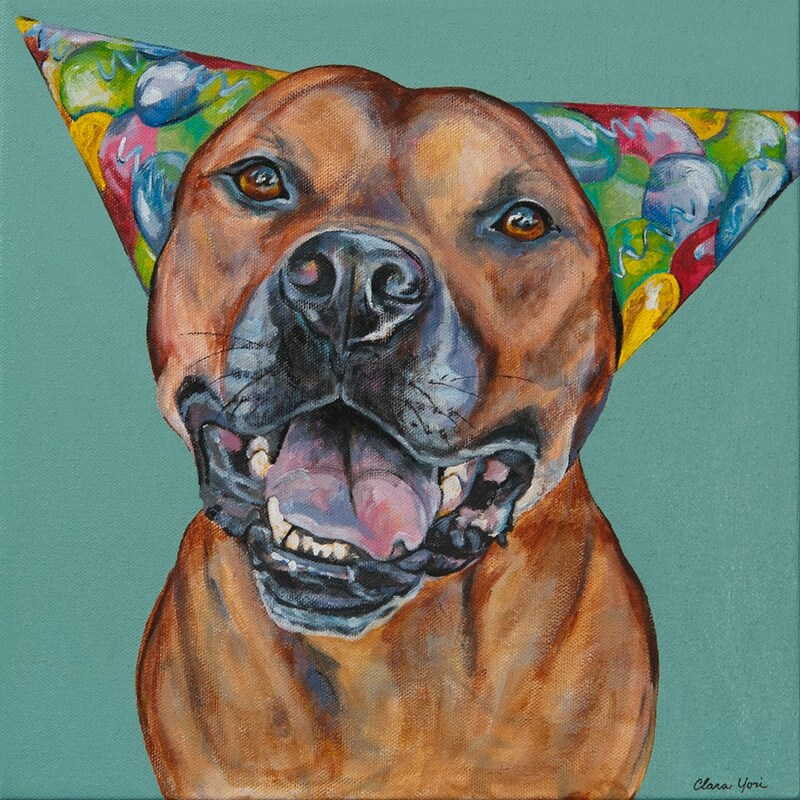 Thank you for sharing your “Hector” portraits & memories. What a special creature he was & how lucky he was to end up as your family member. 1000 gifts is a book about being thankful everday for even the smallest things and writing them in a journal. I bet you have way more than 1000 gifts from Hector. It would be a good way to remember and honor him. What a beautiful tribute and how lucky Hector was not only to have been loved, but to have been loved by YOU. Gosh, that made me cry. Again. So beautifully written. Brings back my own flood of my beloved boy. Thank you so much for sharing his story and journey with all of us. It means so much to so many, as Hector did, for all of his doggie friends. Wishing you peace during this difficult time. Choked up here…thinking of you and Hector – and my own furry loved ones who have passed before. Thank you for sharing our common feelings of love and loss. 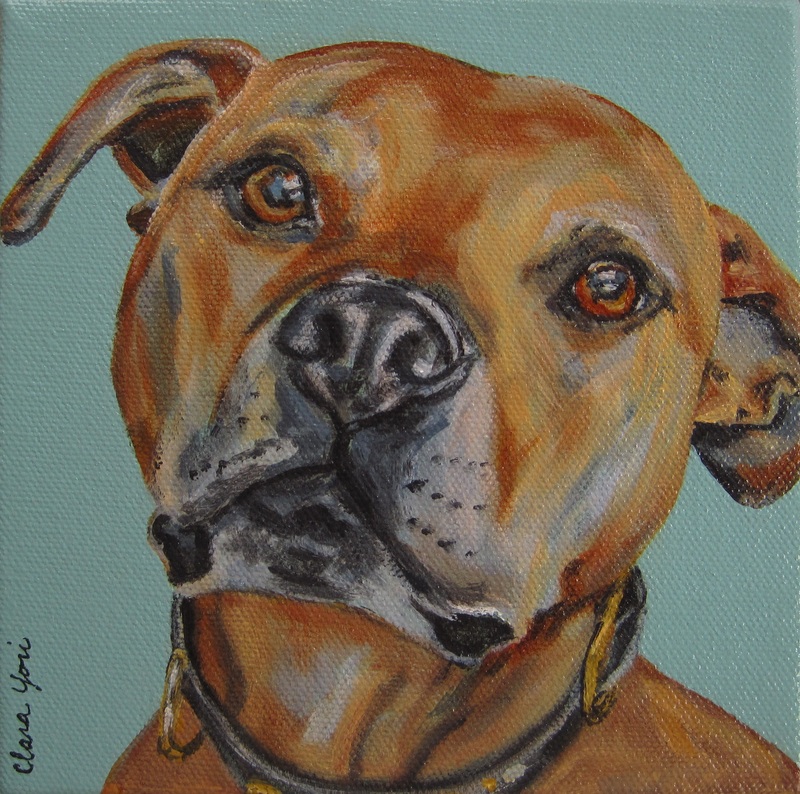 Clara, what a wonderful tribute to an amazing pup. What a story; what a legacy. I’m glad we got to “know” each other over the past year, although I wish it were under better circumstances. Hector was very lucky to have you and Roo – and you were equally fortunate to have him. Thank you.